Dawn Bridges has been named Executive Vice President of Communications for Fusion Media Group (FMG). In this role she will oversee overall communications strategy, including media relations for all corporate and business matters, internal communications, industry issues as well as programming and talent publicity. Having held senior communications roles at Al Jazeera America, Time Inc., Warner Music Group, EMI Group and Universal Music, Bridges brings over 20 years of experience to FMG’s leadership team. She will report to Camila Jimenez Villa, president and chief content officer of FMG, and Felipe Holguin, president and chief operating officer of FMG and coordinate closely with Rosemary Mercedes, executive vice president and chief communications officer for Univision Communications Inc. David Ford, who has taken on an expanded role over the past year as Senior Vice President, Communications for FMG, will report directly to Bridges. We are pleased to announce that Dawn Bridges is joining Fusion Media Group as Executive Vice President of Communications. Dawn will be responsible for driving communications strategy for FMG and ensuring we continue to effectively communicate the ambitious and unique stories behind our platforms. She’s joining our team in New York next Monday and will work in close collaboration with the FMG leadership team reporting to us. Dawn is well-known in the media industry as an articulate, creative and strategic communications professional. She has over 20 years of deep experience building and positioning global brands, executives and products among a variety of audiences. Having worked in senior communications roles throughout her career for Al Jazeera America, Time Inc., Warner Music Group, EMI Group and Universal Music, Dawn has built quality relationships with our peers, key journalists and industry partners. She joins our team from Dawn Bridges Communications, her brand marketing, communications, and events consulting company. There she provided strategic counsel to a range of media, technology, finance, and consumer business clients including Pluto TV, Texture, Chris Blackwell, Island Outpost Resorts, Pledge Music, SESAC, and Peabody Awards. Dawn’s diverse background and experience will be an important asset to our team as we continue to grow. David Ford, who stepped into an expanded role over the past year as Senior Vice President of Communications for FMG, will report to Dawn and continue playing a critical role. As many of you know, David has been with us since the launch of the FUSION cable network in 2013 and has worked tirelessly over the past year managing communications through a number of key transitions. We appreciate his continued passion and dedication. In addition, we want to thank UCI’s Chief Communications Officer Rosemary Mercedes who has supported David and FMG over the past several months. Dawn will work in close coordination with Rosemary moving forward. As we continue to grow our portfolio we have complete confidence that Dawn, David, and the team they’re going to build, will help us continue to engage with young and diverse audiences while building our overall profile. Please join us in warmly welcoming Dawn to FMG. The Fusion Media Group is a multi-platform media company that serves America’s diverse youth with content that reflects their shared passions and values. With some of the web’s most beloved media brands under one roof—including The A.V. 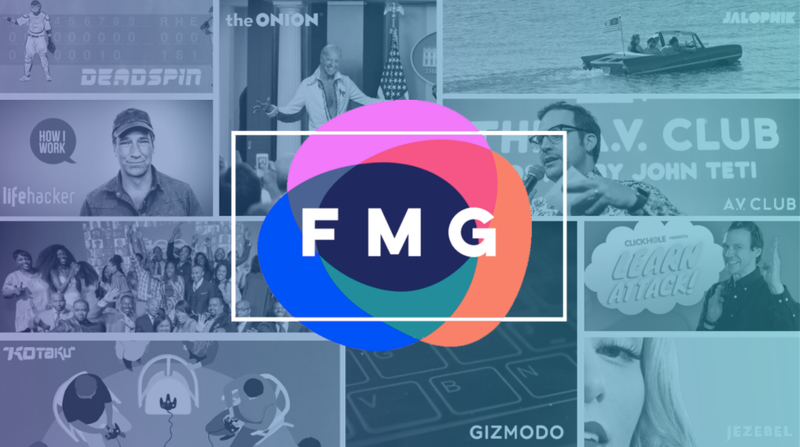 Club, Clickhole, Deadspin, Gizmodo, Jalopnik, Jezebel, Kotaku, Lifehacker, The Onion, The Root, Splinter, and others—FMG is one of the leading digital publishers in the U.S., serves over 100 million super fans each month. FMG extends across a range of platforms with the FUSION cable network as well as Story House Entertainment, its long-form development and production unit.